How Do You Solve a Multi-Step Inequality Using Reverse Order of Operations? Solving an inequality for a variable? Just perform the order of operations in reverse! Don't forget that if you multiply or divide by a negative number, you MUST flip the sign of the inequality! That's one of the big differences between solving equalities and solving inequalities. What's the Order of Operations? Check out this tutorial where you'll see exactly what order you need to follow when you simplify expressions. You'll also see what happens when you don't follow these rules, and you'll find out why order of operations is so important! How Do You Write Inequalities in Set Builder Notation? 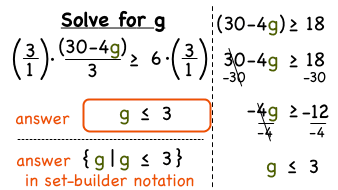 Need some extra practice converting solution phrases into set builder notation? This tutorial was made for you! Follow along as this tutorial shows you how to dissect each phrase and turn it into a solution in set builder notation. How Do You Solve a Word Problem Using a Multi-Step Inequality? This tutorial provides a great real world application of math. See how to turn a word problem into an inequality. Then solve the inequality by performing the order of operations in reverse. Don't forget that if you multiply or divide by a negative number, you MUST flip the sign of the inequality! That's one of the big differences between solving equalities and solving inequalities. How Do You Solve a Word Problem Using an Inequality With Variables on Both Sides?